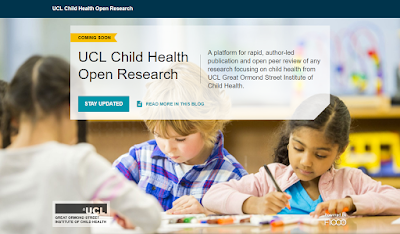 ·UCL Child Health Open Research is a new publishing initiative that will enable rapid and transparent publication of child health research results by UCL-affiliated researchers. It will be launched by the UCL Great Ormond Street Institute of Child Health (ICH) using services developed by F1000. ·UCL Child Health Open Research is part of a shift towards wholly open research publishing, using a model of immediate publication followed by transparent invited peer review alongside inclusion of all supporting data. Publishing data enables reanalysis, replication attempts and data reuse – bringing benefits to researchers and institutions, as well as society more broadly. ·UCL Child Health Open Research will be positioned as an alternative means of publication, complementing pre-publication repositories and traditional journals. ·A process of open peer review post publication helps limit editorial bias and increase speed of publication. ·All publication charges are covered by UCL. What are the advantages of publishing in UCL Child Health Open Research? UCL Child Health Open Research offers researchers at UCL a new option for publishing child health-related research. There are several benefits to researchers who choose to publish on this new platform: Authors, not editors, choose what they wish to publish.Immediate publication allows the sharing of new findings without any delay.Supports publication of a wide range of outputs – from standard research articles to data sets, from new insights to confirmatory or negative results.Authors can choose referees most appropriate to their subject and whose opinions they value, and can cite the open referee comments that vouch for the quality of their work.The inclusion of supporting data facilitates reanalysis, replication and reuse and thus improves reproducibility. We are pleased to announce that the duration of UCL Guest WiFi accounts, which we offer to GOSH and other non-UCL members, has been increased to 4 weeks at a time. Ask staff for details.